Greek Sweet Potato Breakfast Hash (low-amine, gluten-free, soy-free, dairy-free, nut-free, paleo), served with Black Bean Dip Quesadillas. Sweet potato is lower in amines, and has more nutrients available to us than regular potatoes. 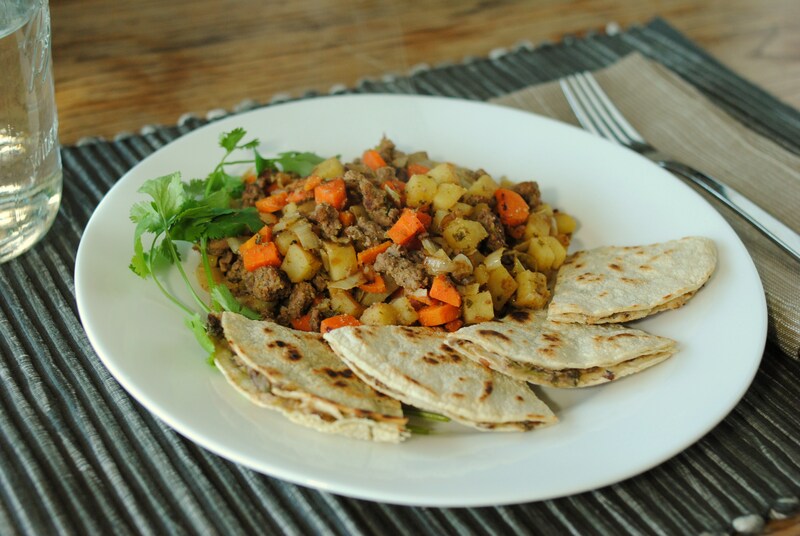 It also makes a mean breakfast hash, and is as simple to use as regular potatoes. 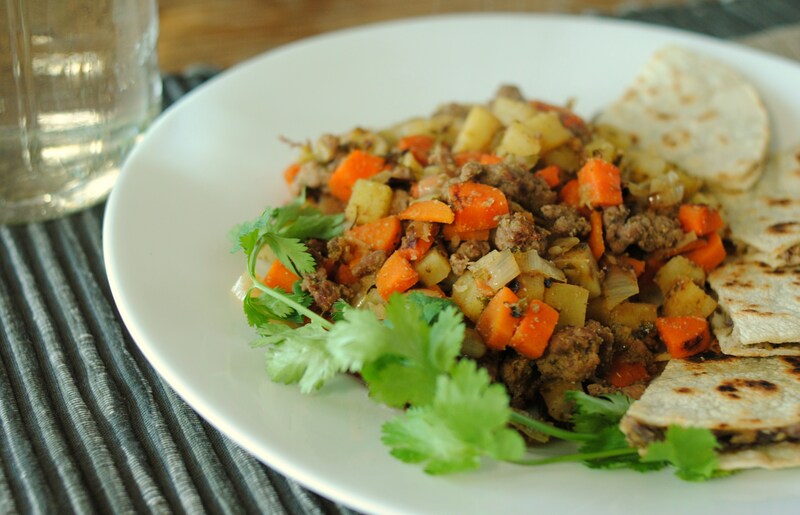 This recipe has a bit of a citrus kick to it from the ascorbic acid, which, with the ground beef or lamb, gives it a slightly Greek feel. Heat a large saute pan to medium heat. 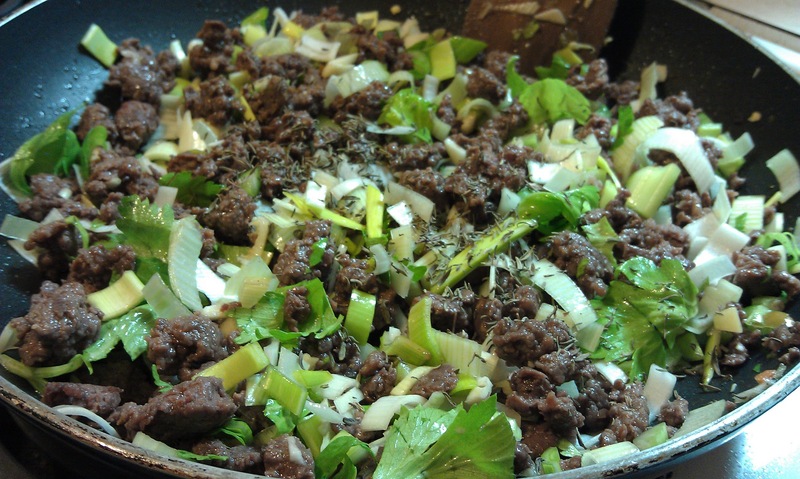 Add ground beef or lamb. Cook until mostly done and drain fat. Add 2 Tbsp butter, then add sweet potato, leek, and parsley. Cover, and stir occasionally. Cook for about 5 minutes, then add carrot and all remaining ingredients. Greek Sweet Potato Breakfast Hash cooking in a cast iron pan. Cook uncovered while stirring often to prevent sticking. Cook until all ingredients are tender, to taste. Serve hot with low-amine tomato-free ketchup substitute. To add protein, I made black bean dip quesadillas (black bean dip spread on tortillas, sprinkled with salt, and heated in a pan). Greek Sweet Potato Breakfast Hash (low-amine, gluten-free, soy-free, dairy-free, nut-free, paleo). Chicken is a great low-amine meat, so long as you remove the skin before cooking. Keeping a skinless chicken tender can be a bit tricky, though. To keep the moisture in, we’ll be simmering the chicken in a curry sauce. Even just a year ago, I would have thought myself crazy for not adding tomato to the pot, but in the interest of keeping the amines in food low, this will be a tomato-free, coconut-free curry chicken recipe. 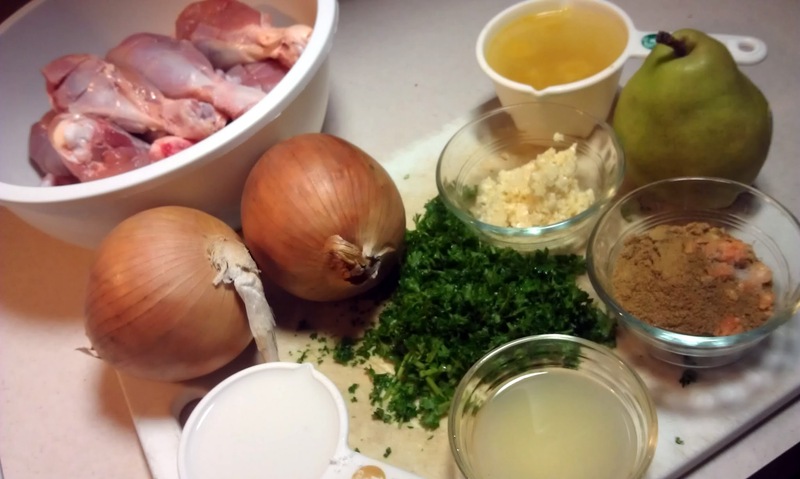 Raw ingredients for low-amine curried chicken. Remove chicken skin. Discard. Score chicken meat three or four times per leg (two scores on each side is ideal). In a deep soup pot, heat the butter and oil. 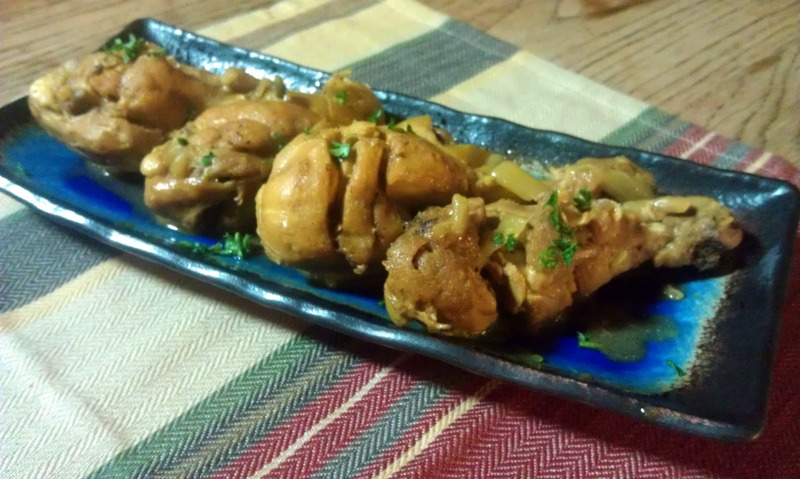 Brown chicken in batches and set aside on a plate. 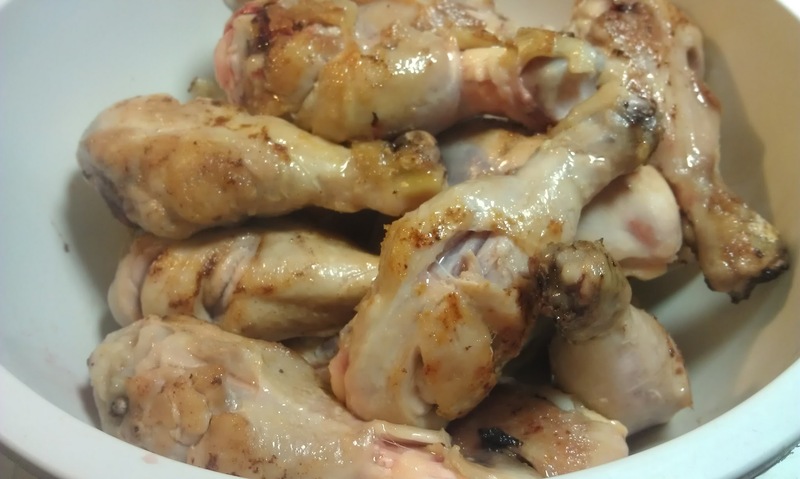 Browned chicken drumsticks for low-amine curried chicken. 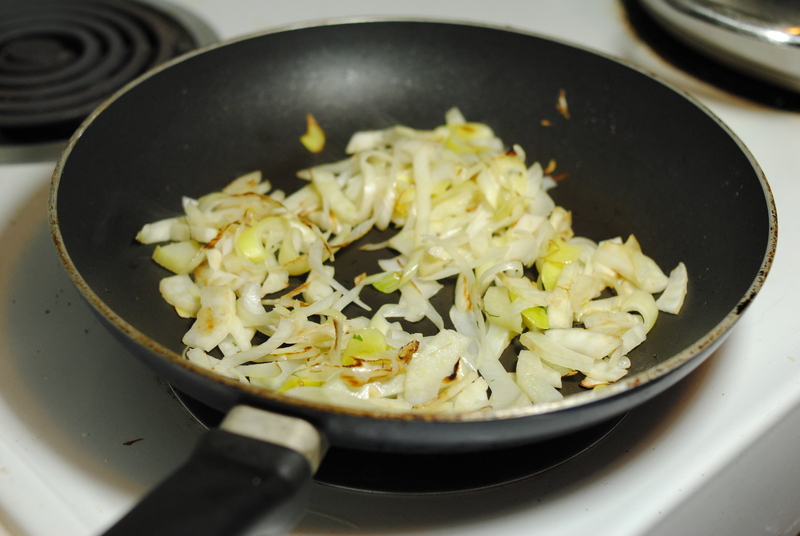 Using the same oil and pot, saute onions and apple until onions are just starting to caramelize. 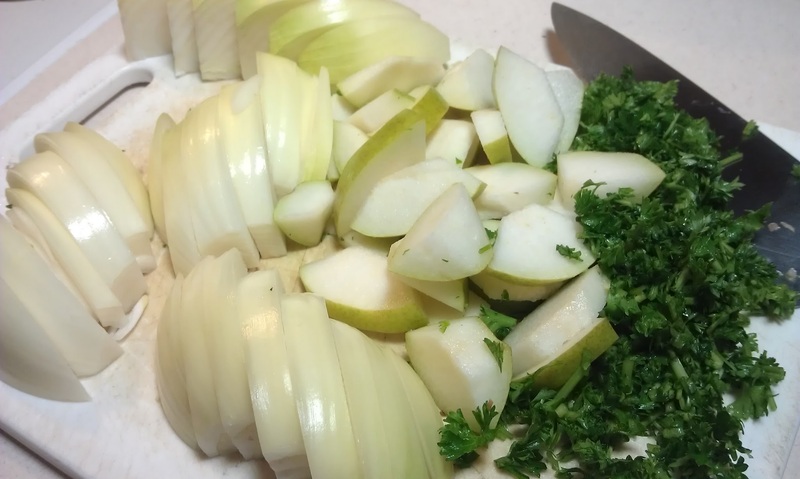 Onions, pear, and parsley cut for low-amine curried chicken. Add garlic, paprika, bay leaf, parsley, salt, white pepper, curry powder, coriander, cumin, chicken stock, and cayenne. Cover and simmer over medium-low heat for about 10 minutes. 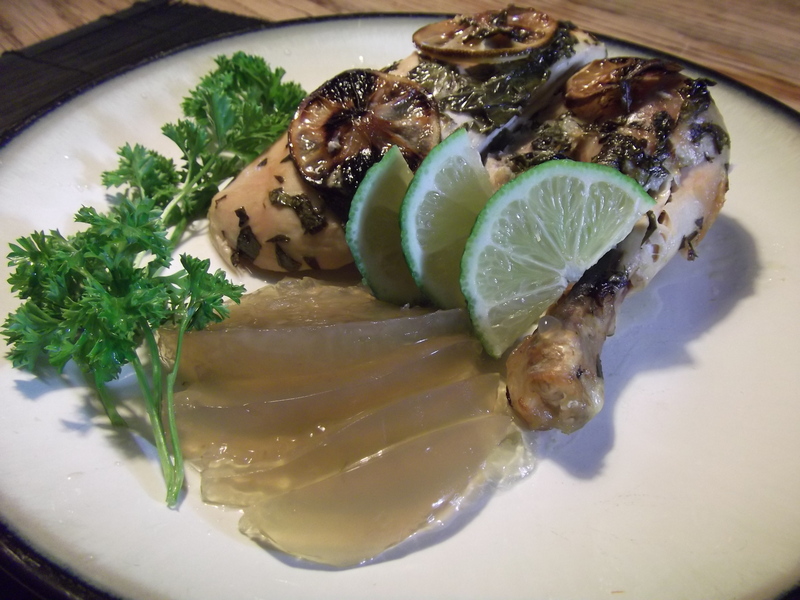 Carefully return chicken to the pot and mix in well with seasoned liquids, onion, and apple. The liquids should come to almost the top of the chicken. 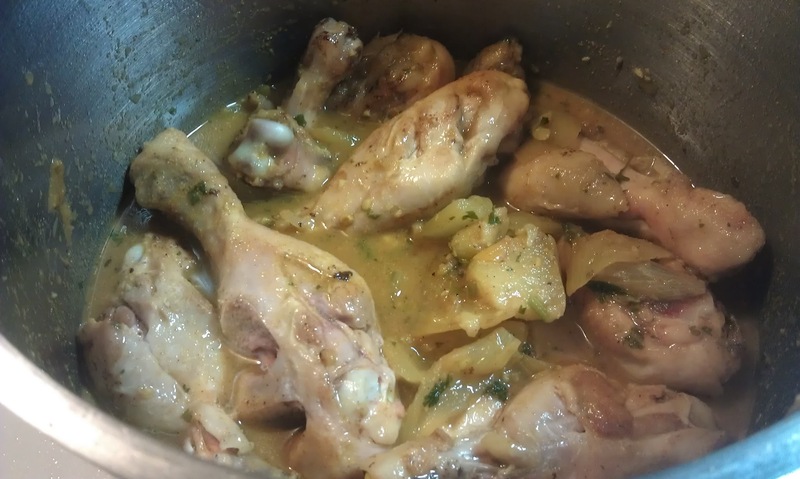 Browned chicken drumsticks returned to pot of spices and liquids. Cover, and turn stove to medium-high until starting to boil. Reduce to a medium-low simmer for 30 minutes. In a small bowl, mix rice milk, lime juice and cornstarch. When the 30 minutes is up, stir rice milk mixture into the pot (make sure it mixes in well so that you don’t end up with clumps of cornstarch). If not already fork-tender, simmer until it is. 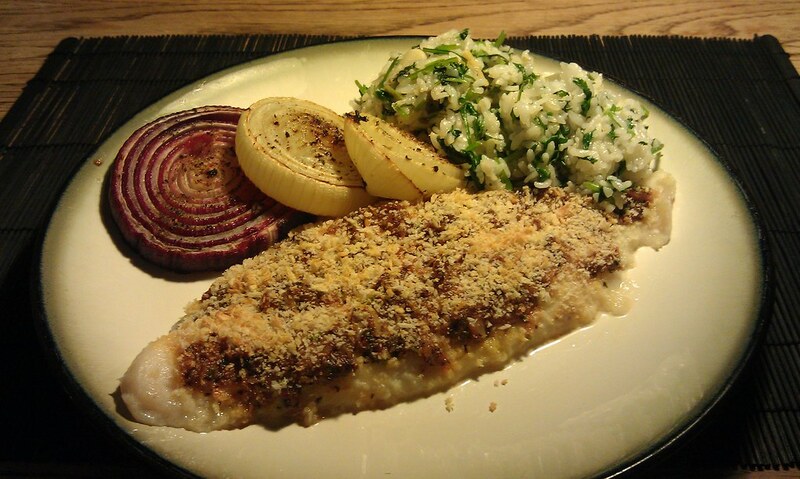 Serve over quinoa, rice, or other starch. Ladle sauce over the top. 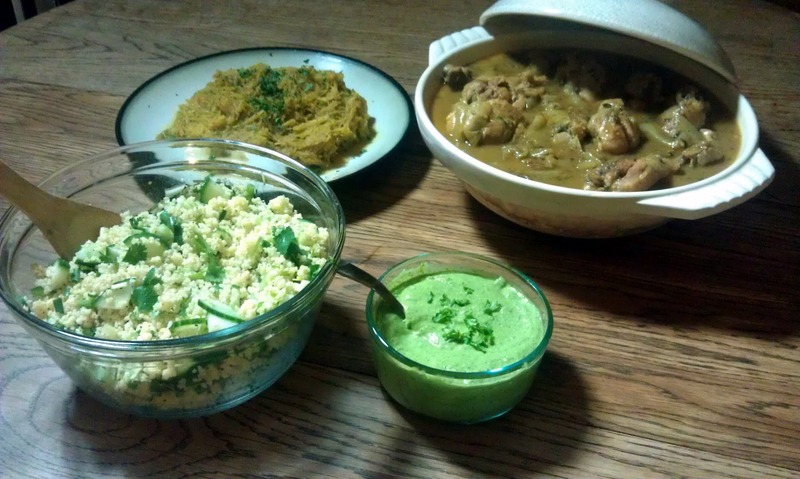 Curried chicken served with a quinoa salad, horseradish avocado lime dressing, and a modified ras el hanout spiced spaghetti squash. Featured on Cybele Pascal and Modern Alternative Mama. 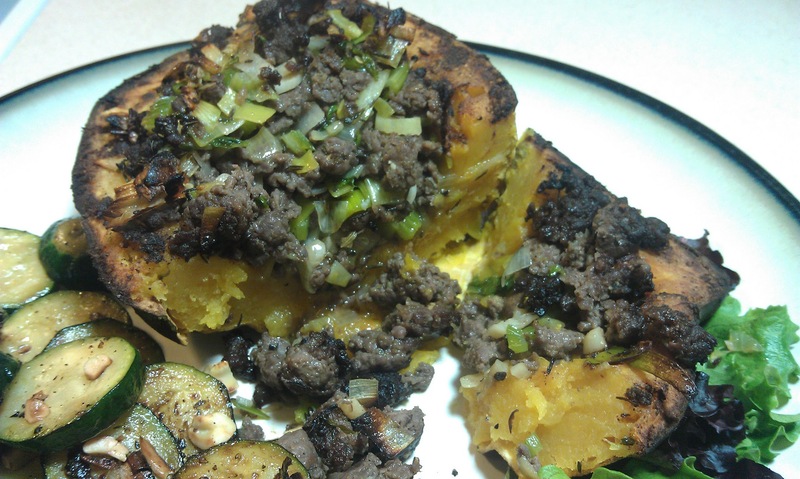 Roasted, stuffed squash is a Fall classic. Not that it’s fall anymore. I most often see squash stuffed with a wild rice stuffing, but I will be dining with a friend who is on a Paleo diet. Instead of rice, we’ll be making stuffed squash with a stuffing made up of vegetables and ground caribou (I got lucky and happened upon it, but you can substitute with ground buffalo or beef. 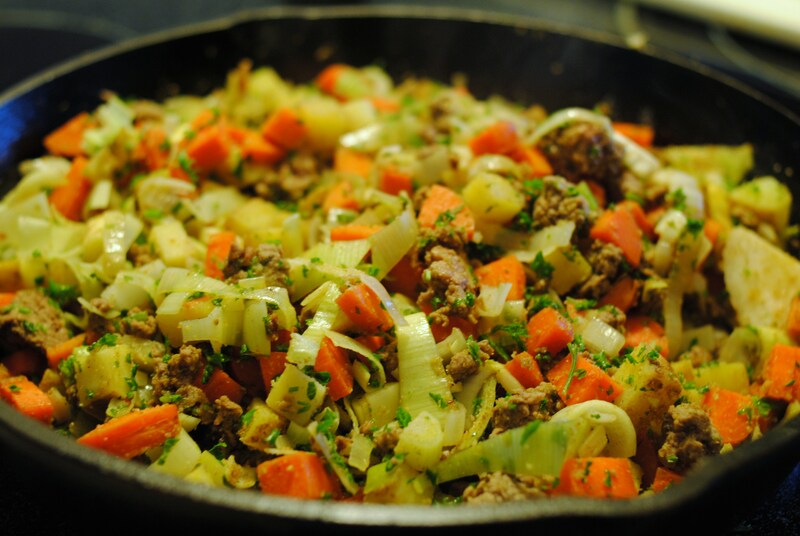 You can also use ground chicken or ground turkey, but add more oil so that it doesn’t dry out.). Preheat oven to 450° degrees with the rack in the middle. 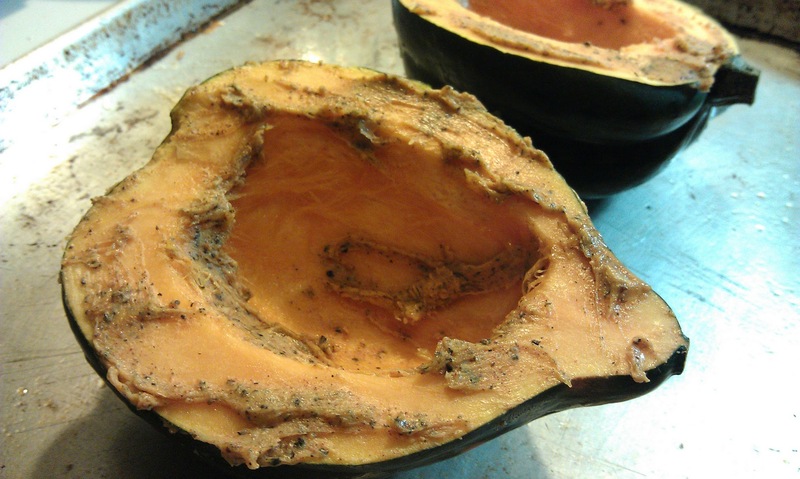 Cut squash in half and remove seeds (you can save them and cook them later, if desired). Mix together onion powder, cayenne, paprika, salt, and black pepper. Place acorn squash on a cookie sheet, cut side up. Rub butter mixture into the squash surface. Bake, uncovered, until just tender, about 25 – 30 minutes. 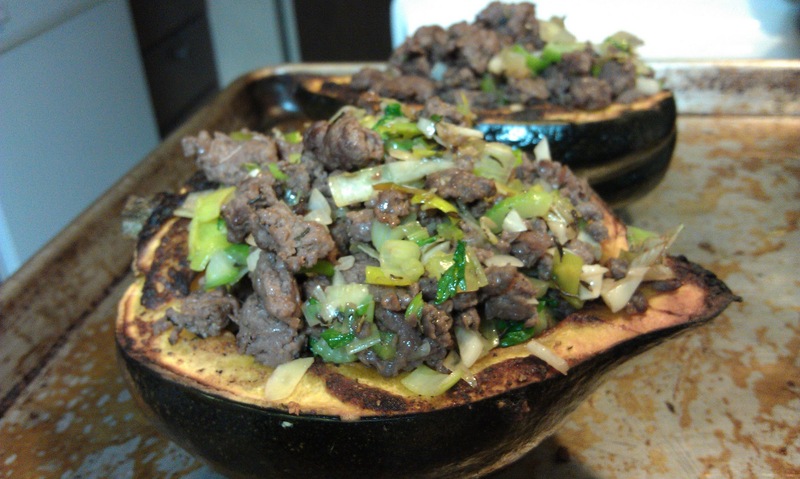 While acorn squash is baking, heat frying pan to medium and add the ground meat and 1 Tbsp oil. Break meat apart as much as possible while cooking, so that it’s in crumbles. Cook till rare. Add chopped leek, garlic, and thyme. 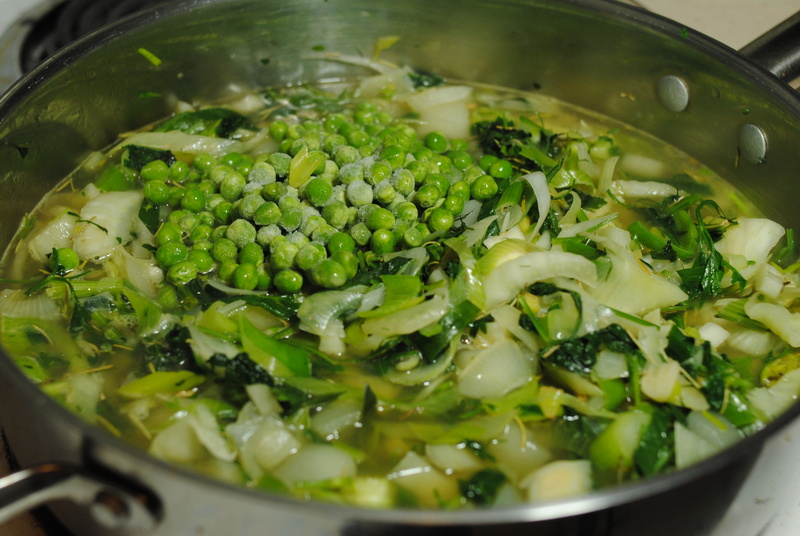 Cook until vegetables have started to soften. Season to taste with salt and pepper. Remove from heat and set aside. When squash is done, fill squash with stuffing. Bake squash, tented loosely with foil, for another 20 minutes. If the edges of the stuffed squash were not already browned, feel free to remove the aluminum foil tent halfway through. It is mostly to prevent the filling from burning. The squash should be very tender when done. Lime basil chicken is super simple. Doing it low amine is even simpler – just take the skin off. 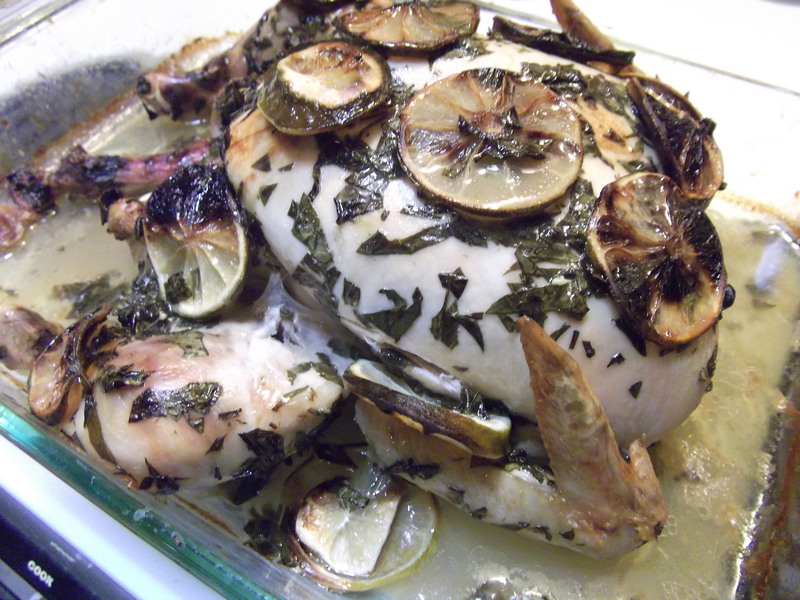 The only catch with a skinless chicken roast is that you have to baste, and baste often. I basted the lime basil chicken every 20 minutes or so to ensure it had no chance to dry out. Preheat oven to 350 degrees and set rack to middle. Remove skin from chicken, and rinse off (inside and out) with water. 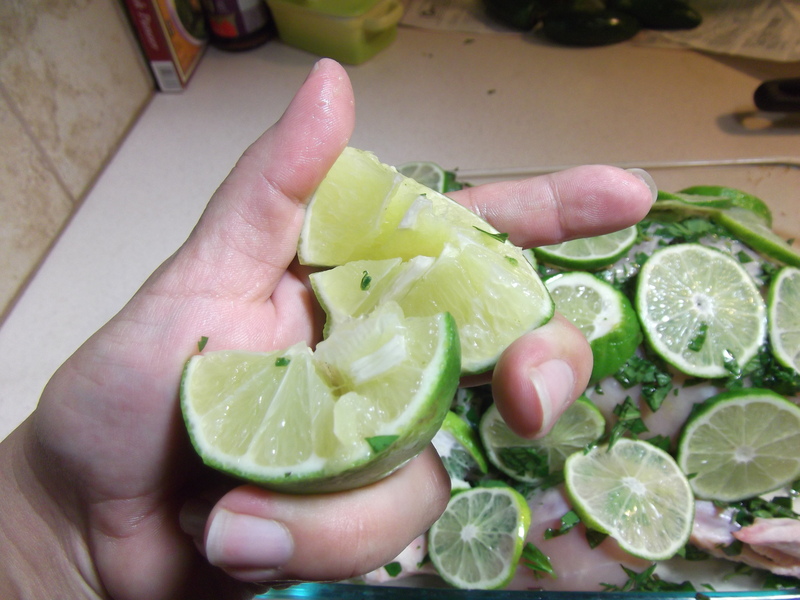 Slice one lime into four quarters and cut each piece to assist juices coming out. Mix salt and ascorbic acid together in a ramekin. Set into large Pyrex pan and rub down (all over outside and inside cavity) with salt and ascorbic acid, then basil. Slice one lime thinly into rings. Lay rings onto chicken (I went a bit overkill on mine – I used two. I’d suggest using only one.). Pour chicken stock into pan. Bake for 1 1/2 – 2 hours, or until done and juices run clear. 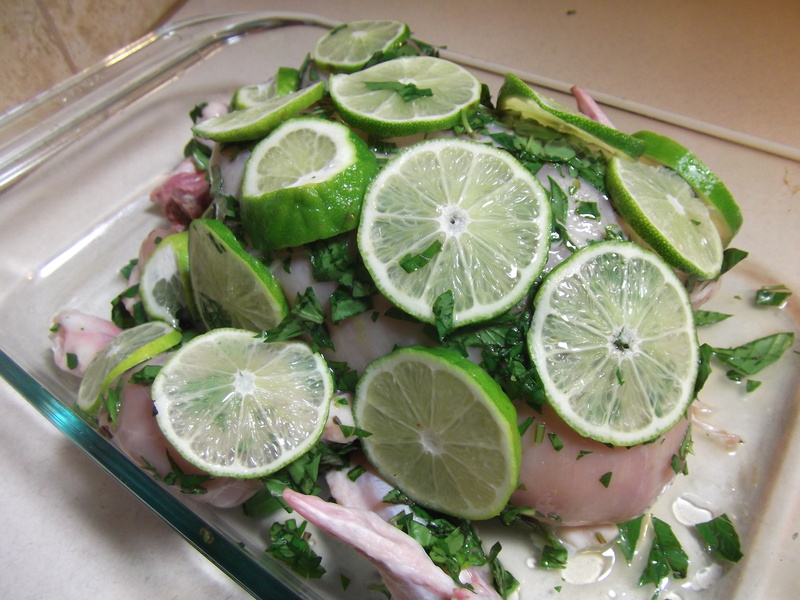 While you’re baking the chicken, work on the Jalapeno Mint Jelly to accompany it. Making gluten free or amine free / low amine pasta dishes can be difficult. This low amine solution is sure to please all with its rich, yet light flavors. I would suggest serving it with a protein of some sort, such as butter-sauteed prawns or fried/baked tofu. Poke a couple holes in your spaghetti squash. I hit mine twice with the cleaver to put a 2″ slash in it for steam to escape. Microwave squash on high for 10 minutes, rotating once when halfway done. Microwave times vary – it is done when the sides of the spaghetti squash easily cave in with a gentle press of a finger. Remove carefully using oven mitts, and cut in half to cool. Slice zucchini in half lengthwise, then cut into bite sized pieces. Use 3 zucchini for spaghetti squash recipe. 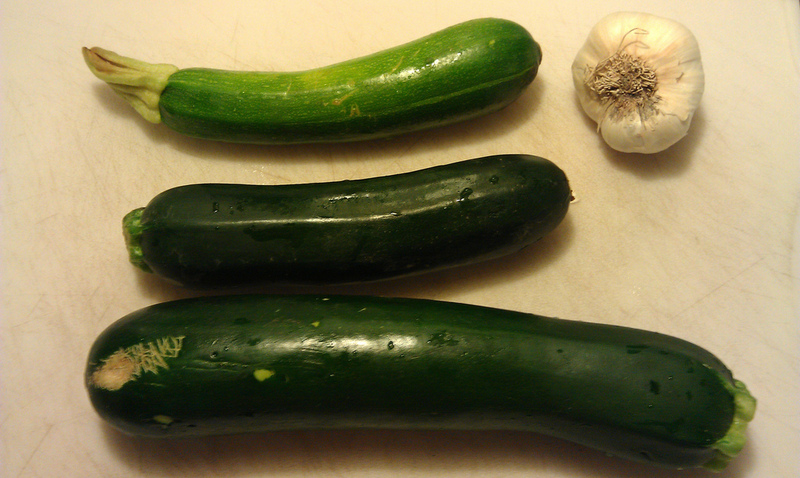 I used two small/medium sized zucchini and one mutant zucchini. Garlic bulb added for size perspective. 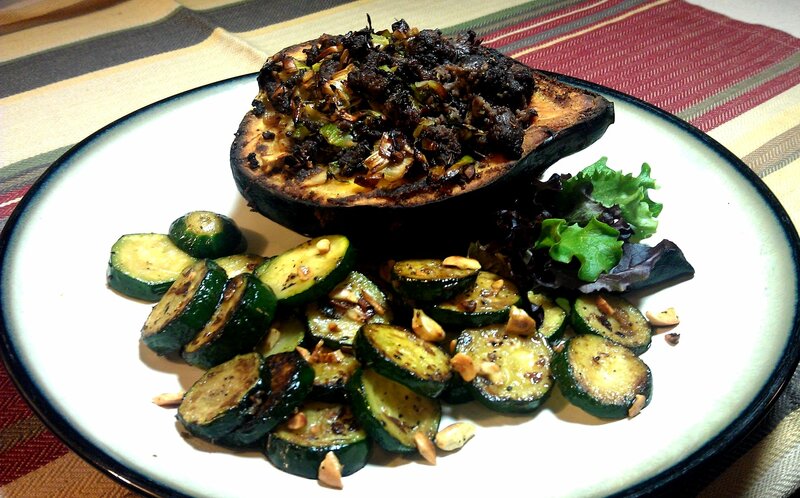 Heat your stove top to medium low and in a non-stick pan, fry the zucchini in 2 Tbsp oil, uncovered, for 15 minutes. Stir/flip zucchini as necessary. While the zucchini is cooking, use a fork to remove seeds from squash. Toss, or roast them later for a snack. Pull spaghetti squash flesh out with a fork. It should “shred” out easily. Wash basil leaves and slice them into slivers about 1/2 – 1″ long. 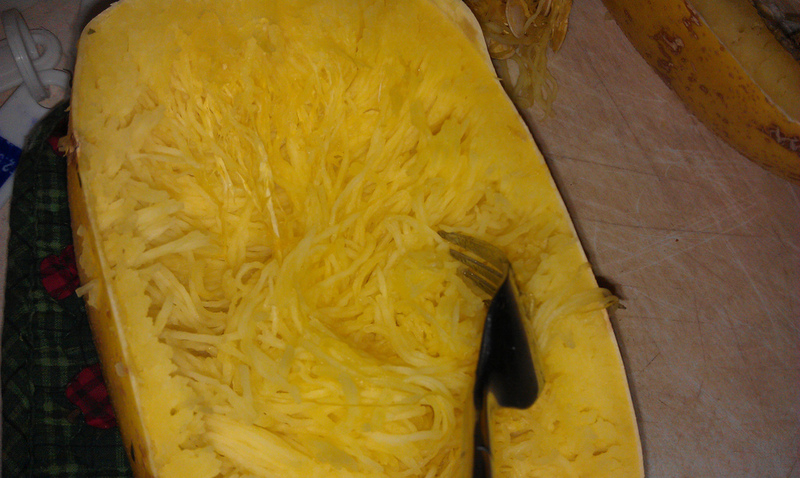 To shred Spaghetti Squash, use a fork and gently pull threads toward center of squash from the edges. 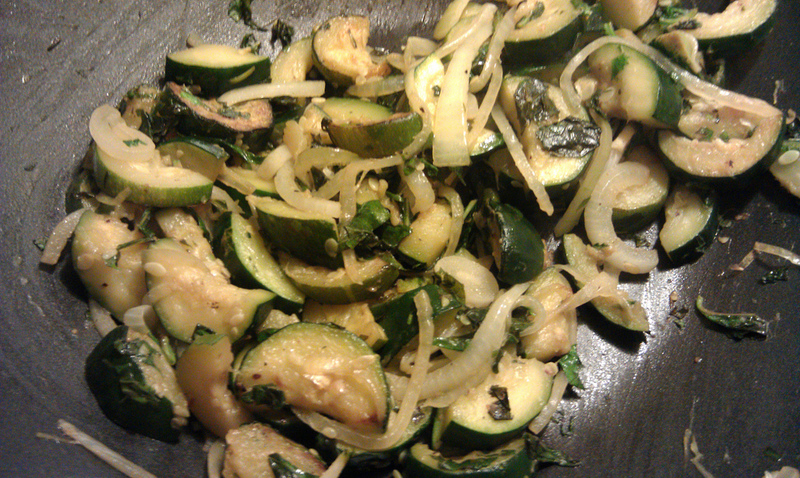 At about the 15 minute mark on the zucchini, add in the basil, salt, onion, and pepper. Mix in well and stir occasionally. In a separate non-stick pan/wok, on medium high heat, add 2 Tbsp oil. When the pan is hot, add garlic and cook till just fragrant, about 1-2 minutes. Add spaghetti squash to pan and mix well. Cook for 10 minutes, stirring occasionally. 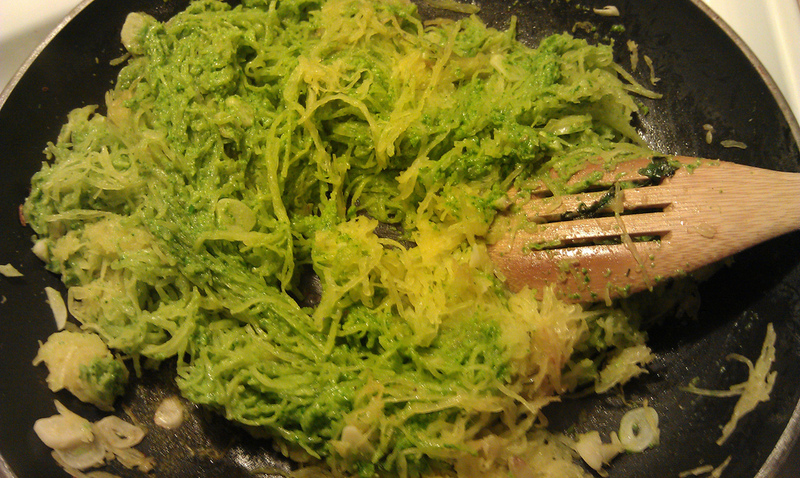 Mix low amine pesto to spaghetti squash with 1/2 C water. Gently stir together until evenly coated. 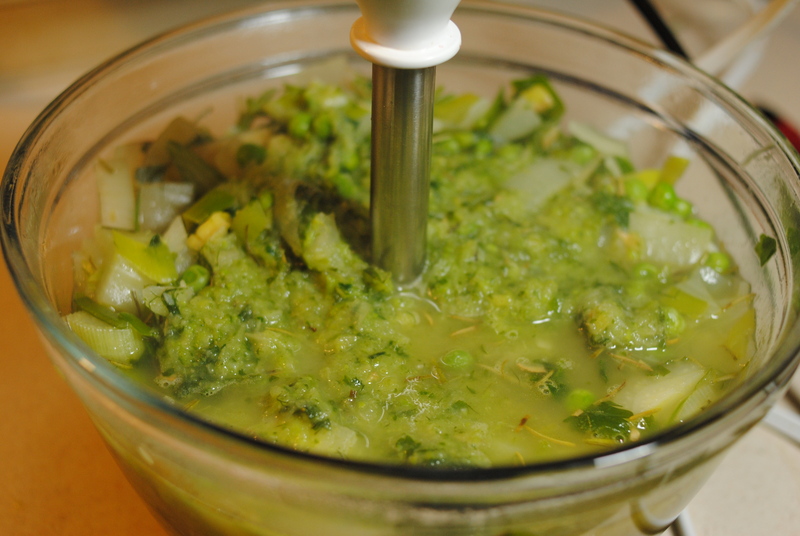 Gently mix Spaghetti squash with 1/2 C low amine pesto and 1/2 C water. 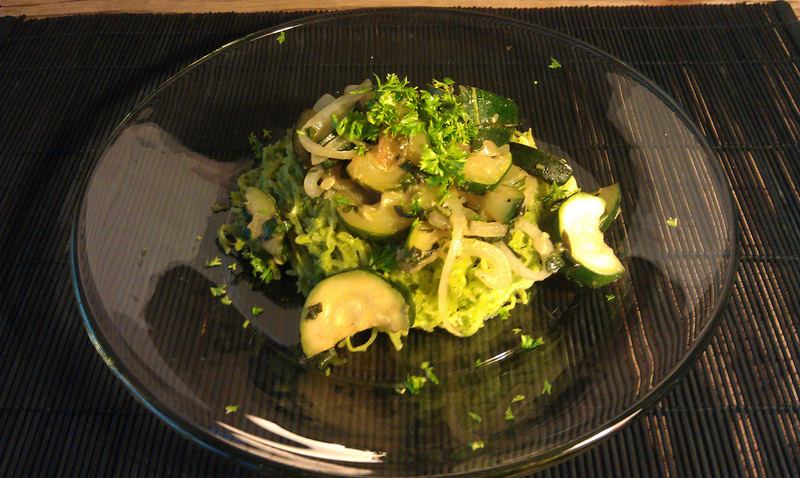 Plate with zucchini served over the top of the pesto spaghetti squash and garnish with minced parsley. 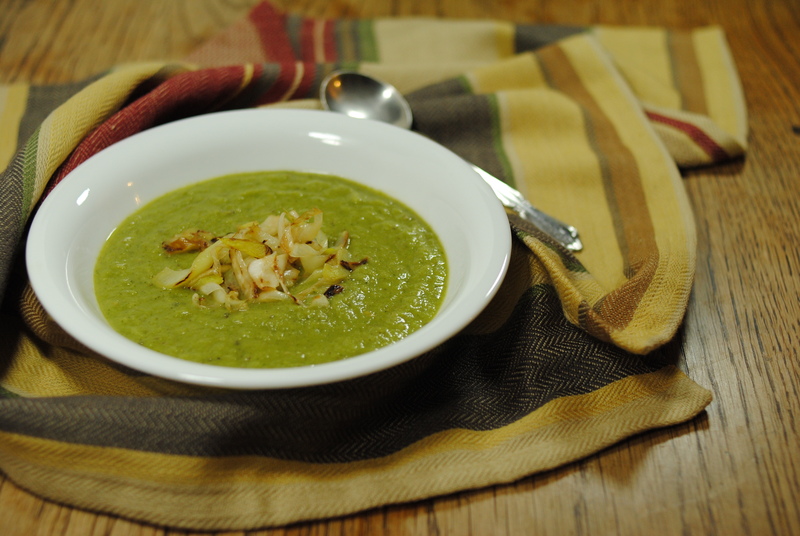 Serve with a lime wedge on the side, or with the juice of one wedge squeezed evenly over the top. 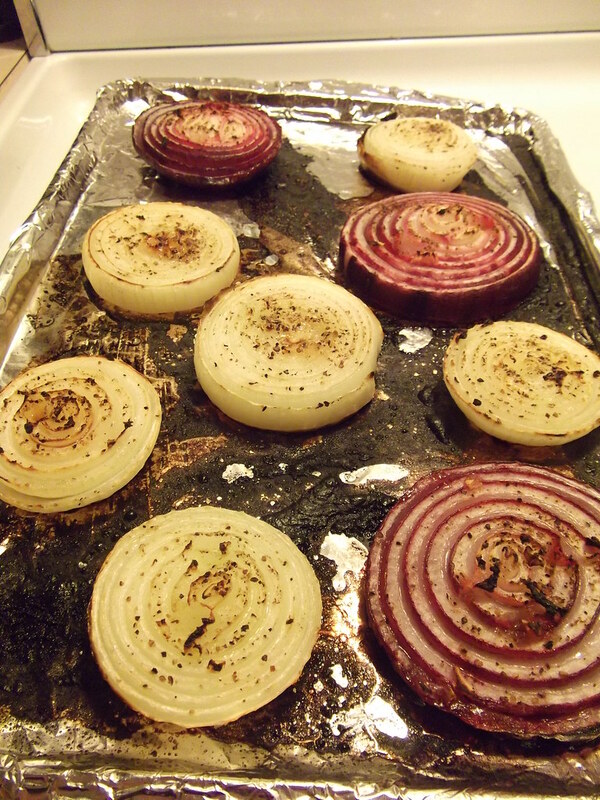 These thick onion slices make a fabulous side dish for any low amine meal. I used to make these with lemon juice and olive oil, so hadn’t made them since starting my amine-free diet. I decided to use a lemon substitute instead, and it worked out fabulously! These low amine onions were a powerhouse of flavor, and so stupid easy that I could make them every day. Peel both onions and cut top and bottom ends off. 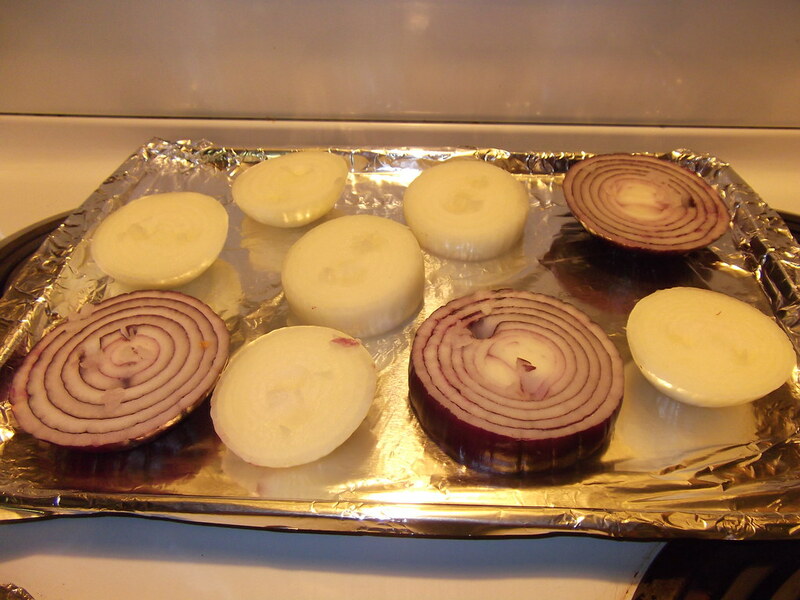 Slice each onion into three or four big onion ring slabs (about 3/4″ thick) and set on cookie sheet to bake. Using the point of a paring knife, “carve” two small dents into each onion, about the diameter of a dime. These pools will help hold the sour liquid so it does not simply run off onto the pan. Mix ascorbic acid and water together. It should mostly dissolve. Pour over the top of onions. Drizzle Safflower oil over the onion rings. Crack pepper and salt over onion rings. Bake for 15 minutes, then broil for another 5 minutes to lightly blacken them on top at the edges, to give them a “grilled” look.